A WC Where?! Don't Hesitate – Macerate! One of man's very greatest inventions has to be the humble toilet. There are so many different types but all have the same function and you find them in the strangest locations; indeed, wherever you find people! Technology today means that you can have a convenient, quality toilet almost anywhere — don't hesitate, just macerate!. 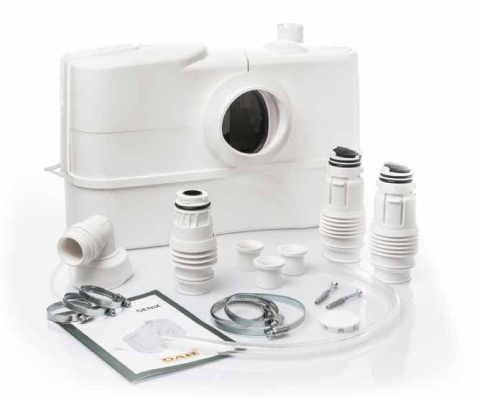 HECAS proudly supply the Genix range of macerators from Dab pumps and, as with our entire range of boiler parts, water storage systems and fires, can offer the most competitive price around. A macerator grinds waste from the WC into a liquid which is pumped to the main soil waste disposal via a small pipe. The main sewage pipe must pass immediately vertically away from the WC to comply with building regulations and Genix macerators are powerful enough to efficiently pump waste in any appropriate direction, including vertically upward. This means that a WC can be installed anywhere, even if it is at a great distance from the main sewage pipe. Thanks to the innovative design of these quality macerators, the system can even be installed in areas of low water pressure. Need help finding exactly the right macerator to suit your unique circumstances? That's what the HECAS Team are here for. We employ a highly-skilled and experienced staff who are conversant with every one of our thousands of products, from the best-known boiler spares to the most obscure fire spares and much more in between, such as our money and space saving macerators. Call us today and let us help you towards a better, greener, cleaner home.